Continued from Teenage Mutant Ninja Turtles #11. A Triceraton mothership is nearing the planet Earth. The commander of the craft has followed the beacon from the homing device on the D.A.R.P.A. base – but we discover that all is not well on the vessel. It seems that the Triceraton ship had been sent to trace the Transmat signal that the TMNT used to return home after the Turtles’ first encounter with the saurian aliens (TMNT Volume One #6) – but something went awry during the pursuit and the Triceratons lost the signal, thus becomming lost in space. The ship had been adrift for years, slowly degenerating from lack of resources, until they discovered the signal from the homing beacon and renewed their course towards Earth. Most of the crew has since died from a virus, so all that remains now is a small band of warriors and a commander determined to fulfill his mission, regardless of the condition of his craft. The TMNT’s alien allies locate their weapons and gear up. 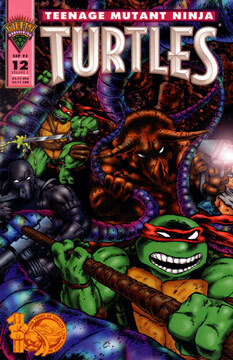 Soon enough the group discovers where Raph is being held, and Michaelangelo breaks open the tube holding his brother. The team splits up to search for an escape route. The Triceraton and the large alien find a stairwell and begin to climb it. Almost instantly the pair is attacked by D.A.R.P.A. guards, but the aliens prevail. As soon as the coast is clear, the Triceraton fires on his companion, killing him. Michaelangelo arrives and the Triceraton claims that the humans killed their compatriot. The pair rejoin the others. Leonardo announces that they’ve found an escape route through some sort of cave. As the team navigates the tunnels, they come upon a steep cliff. At the bottom of the ravine lies a monstrous starfish-like alien. Before anyone can react, the monster shoots a tentacle out of its maw that impales Nobody through the chest. The Triceraton fires at the behemoth, but it retracts its appendage and devours Nobody. Casey grabs a bomb out of Nobody’s abandoned duffel bag and tosses it onto the monster lying below. The blast cripples the creature, but it also causes a cave-in. Everyone escapes beign crushed (save for the monster, which is now buried in rubble). Leonardo spots a fresh hole in the roof of the cave, and everyone climbs over the debris to escape. Concluded in Teenage Mutant Ninja Turtles #13. Additional Material: 6 page Bog story by Ryan Brown and Matt Roach.